IMMA in India - META-Health Academy. What happened at the 8th International META-Health Conference? Jumping in at the deep end, they were invited to attend a televised awards ceremony on their first evening in Mumbai. Hosted by the ISHMA World Foundation, they and the other Master Trainers present were awarded for their Services to Humanity through META-Health. Two days later, the Conference was on! While the main intention was to spread the META-Health message within the Indian community, there were an unexpected number of international delegates, from countries including Norway, South Africa and Canada. 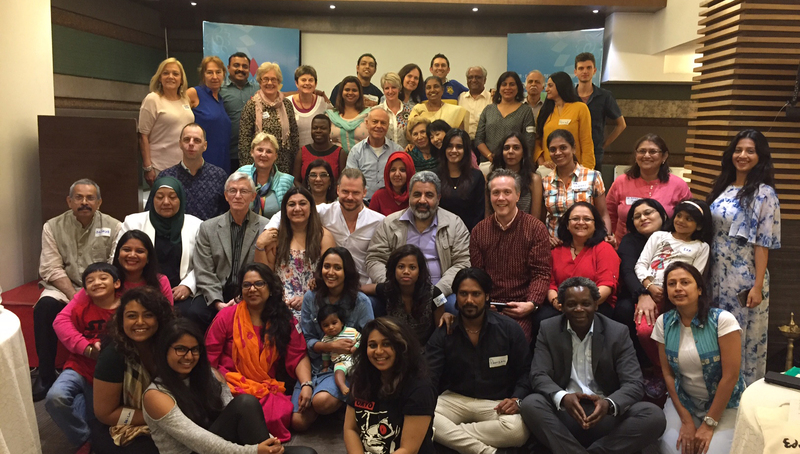 With speakers from Germany, UK, Japan, Egypt, New Zealand, the Netherlands, Canada and more, there was a truly international feel at a uniquely Indian conference! Alongside the META-Health speakers, the varied Conference programme included Indian doctors, homeopaths, meditation experts and even a couple of celebrities sharing their healing stories! What most struck Robert was the camaraderie and community atmosphere – everyone’s openness, willingness to learn and desire to share created what he felt was the most friendly, welcoming and supportive atmosphere of all IMMA events so far. Those who have been to previous conferences will know what a big achievement this was! Well done to Anu Mehta, India’s META-Health Master Trainer, for organising and hosting such a wonderful event, and to Dr Kwesi, who co-organised the Conference as part of his role as IMMA President. Then finally, some time off to enjoy India! Robert, Kwesi and three others travelled to Pune to the Osho Meditation Centre for a well-deserved rest, intertwined of course with some deep self-exploration and change work! So how did Robert feel, being back in the city where his grandfather had lived? Hit by a wave of mixed emotions when he first arrived, he said he soon felt strangely at home with the energy, people and even the friendly chaos of this unique and special place… and enjoyed it so much that he may be back to share META-Kinetics and other developments in the near future!